The fabric I'm using is 30 ct. Alabaster by R&R. Thanks for visiting my blog. Great starts! 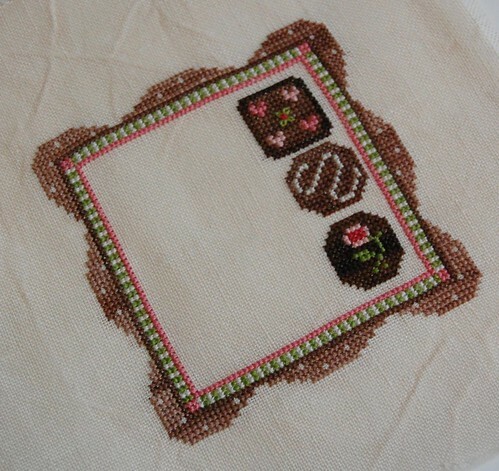 You will have to post that chocolate box when it's totally finished! I can't wait to see it. Your needles just fly! You have really done a lot on Chocolate Box! Can't wait to see it all finished up. Your Chocolate Box and Canvas work are all really pretty! You just seem to get so much done!! I love all of these. I may see your canvas works and want to try it again. I think that you are doing the best canvas work by getting the patterns rather than using the painted canvases. Those would be more like a paint by number thing to me and these are creating something on a blank canvas. What count canvas do you use or does it come in counts? Your chocolate box looks delicious! And the canvas work is just beautiful!!! they are all beautiful! Wow, the chocolate really 'pops' on that fabric!! Your blog is always so inspiring! I like this style very much, but it is not possible to receive one like this unfortunately at us. Your chocolate box looks yummy! 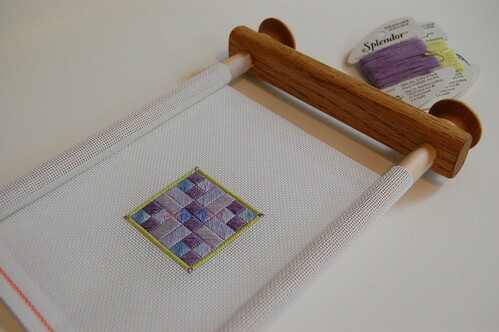 Our guild is teaching canvas work this Saturday and we are going to make a frame weight. We will learn how to do the finishing at the next meeting. I think it will be interesting. Mmm! Those chocolates look yummy! The canvaswork is really pretty too. That looks good enough to eat...mmmm chocolate:) I cant wait to see it finished. 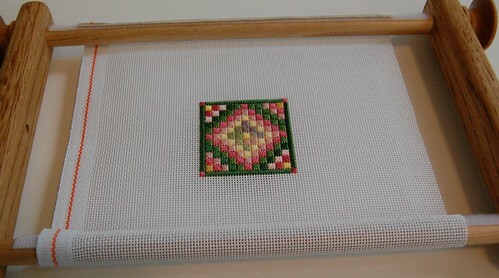 I love counted canvas, it's easier to see and a nice change occasionally from those tiny little cross stitches. I'm hoping Chocolate Box will be at my LNS today. Please save me a dark chocolate! Lovely start on the canvas work - now do I really want to try this. Very cute start on Chocolate Box, Nicole. I can't wait to see this one finished! Great start on the chocolate box ... I'm sure you will have fun with Amy finishing it. Ooooo, fabulous fabulous fabulous! (You have to do that while clapping your hands like Eddie Murphy's mother in The Nutty Professor, by the way). Everything you do is so wonderful! I'm so glad to see that you did some LJP's! Weren't they fun?! Love the canvas work! Thanks for pointing me in the direction of some freebies! Both are so pretty. Your needles are definitely smoking. I like the frame that you used for the canvas work. May I know what frame is that? Your chocolate box is coming around real well. Very pretty! So is your canvas work!